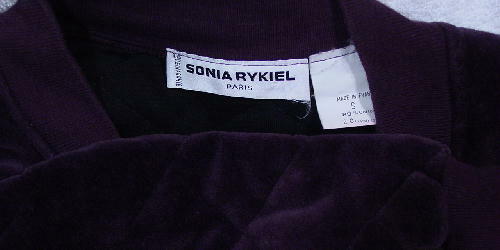 This quilted Sonia Rykiel jacket is in a deep plum/eggplant color and is 80% cotton and 20% polyester. It has a modified scoop neckline, a 20 1/2" long front zipper, and a drawstring waist. There are raglan long sleeves and 2 front angled pockets. 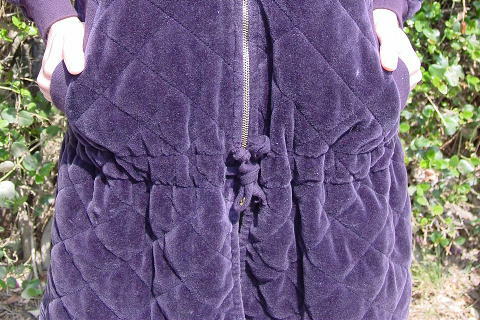 The jacket extends downward 8 1/2" from the bottom of the zipper. The tag says it's size Small, but it fits like a size Medium. 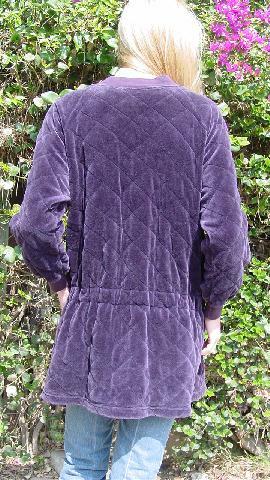 It's extremely soft and cuddly. It was used in a magazine photo shoot with velour Sonia Rykiel pants and a Betsey Johnson skirt wrapped around the model's head.